Rogoff (1994) believes that technology can act as a catalyst influencing change from a traditional classroom to an environment of community of learners. One way to successfully integrate technology in schools is to use a constructivist approach. Here the environment provides facilities for students to learn by doing, to work with others, and to have authentic experiences, motivating learning and making it relevant. Technology provides cognitive tools for students as they make sense of the information gathered, allowing experts, teachers, and students to communicate their thoughts and interests in the subject matter and simulating real-life situations and problems. Laptops can hinder or help children. The software has to be well-designed for the purpose f “teaching the child to learn”. Courseware: A computer programs and associated courseware material designed for educational or training purposes. Once the hardware, software, and operating system have been provided, courseware is the missing component to make the computer didactically useful. Simple English: Material written with a small, basic vocabulary intended for use by people learning English and for teachers in English. Lifelong Learning: The continuous, (formal and informal) process of independent, personal self-development through acquiring knowledge and skills from diverse sources (and in diverse places), which goes far beyond the formal education of the individual child or adult. OEPC: One Encyclopedia Per Child is an initiative to put useful content into the OLPC. Child: A young person, typically under the age of 13; older than this the person would be classified as a teenager. Various other Web references would have us believe that a child is under 6, 16, 18, or 21. Encyclopedia Entry: One item in an alphabetically arranged index which points to an encyclopedia article. OLPC: One Laptop Per Child project (OLPC) will be deployed in rural, poor, developing countries where education is hampered by the difficult conditions, such as reliable power. It accomplishes this through the use of flash memory. The OLPC is a 24/7 free-standing opportunity for learning. Wikipedia: A free online, multilingual, open content, Web-based, advertisement-free encyclopedia service. The service has succeeded in the aim of creating and distributing a free, online international encyclopedia in as many languages as possible. It is written and updated collaboratively by volunteers, allowing almost any article to be changed by any reader. Because of its public nature and potentially broad base of contributors, Wikipedia is essentially free of bias. Its editorial policy is to adopt a neutral point of view, representing views fairly and without bias (Wikipedia, 2006a AU15: The in-text citation &quot;Wikipedia, 2006a&quot; is not in the reference list. Please correct the citation, add the reference to the list, or delete the citation. , 2006b AU16: The in-text citation &quot;Wikipedia, 2006b&quot; is not in the reference list. Please correct the citation, add the reference to the list, or delete the citation. , 2006c AU17: The in-text citation &quot;Wikipedia, 2006c&quot; is not in the reference list. Please correct the citation, add the reference to the list, or delete the citation. ). Encyclopedia Article: Academic or popular writing which summarizes and synthesizes available information from a variety of sources. It usually includes a selective bibliography of authoritative articles and books on the topic covered under the encyclopedia entry. Each encyclopedia article usually gives a broad overview and background information plus references. 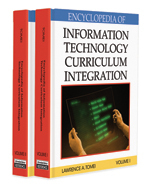 Courseware Material: Educational content (text, pictures, etc.) and associated programs to deliver that content. Encyclopedia: A reference source of brief, informative, authoritative articles on a variety of topics. The encyclopedia entries are usually arranged in alphabetical order. Encyclopedias can be general—covering all topics, or specialized— or focusing on a particular discipline such as information technology. Encyclopedias are useful in providing wide-based knowledge to children or background information for adults before they start out on research. The systematic approach adopted assists in the serendipitous or purposeful finding of information. A well-rounded education presumes access to and use of a good encyclopedia. Problem-Based Learning: The main idea behind PBL is for the educationalist to introduce a topic through the use of projects, problems, puzzles, or questions as a starting point for the children’s learning process. The problem is posed so that the children discover that they need to learn some new knowledge before they can solve the problem. PBL is thus a user-centric and self-directed method of learning which prepares children for lifelong learning.